Venice Floral Dress https://www.review-australia.com/au/venice-floral-dress-blue/RE18DR333.REBLU101.html You'll be a dream in vintage florals this season wearing the gorgeous Venice Floral Dress. In a super soft stretch cotton, the fully lined dress features a prom style silhouette ?fitted at the bodice with a voluminous box pleat skirt. With a wide v-dip neckline and cap sleeves, it is finished with a coordinating detachable patent belt. Worn with the Minnie Pump/Heel and the Jenna Bag. 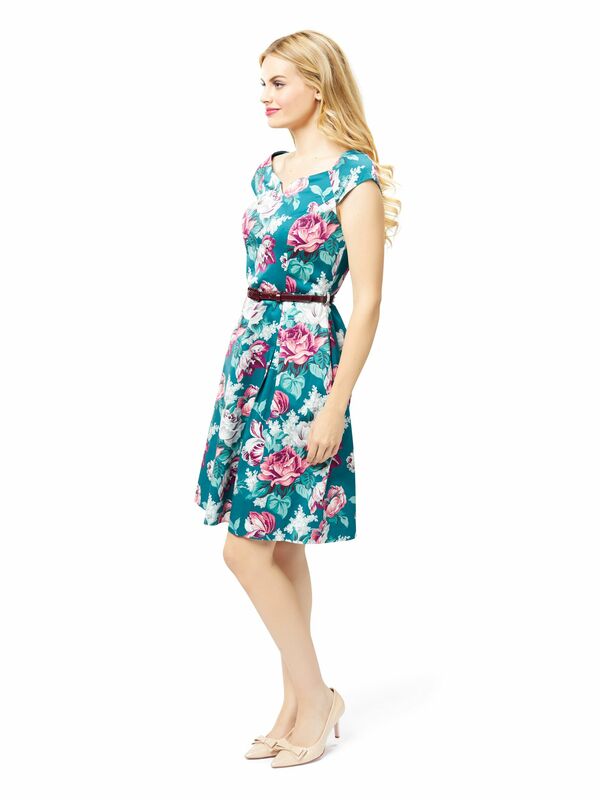 You'll be a dream in vintage florals this season wearing the gorgeous Venice Floral Dress. In a super soft stretch cotton, the fully lined dress features a prom style silhouette ?fitted at the bodice with a voluminous box pleat skirt. With a wide v-dip neckline and cap sleeves, it is finished with a coordinating detachable patent belt. Worn with the Minnie Pump/Heel and the Jenna Bag. 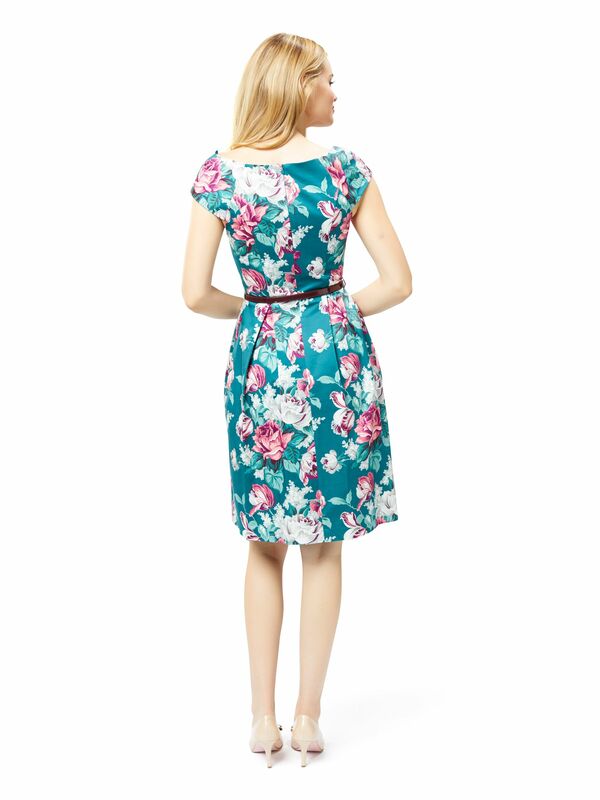 Venice Floral Dress is rated 4.5 out of 5 by 42. Rated 5 out of 5 by KTuimaseve77 from Beautiful colours and fabric. I bought this because I desperately wanted a dress for work and church. I love these colours and wasn’t sure about the cut on me. I’m 178cm and 80kgs and I bought 16 to be safe. My husband loves it and tellls me how pretty I look. It is a tad big but I am loosing weight and can see so will take it in. Love this dress and recommend it!! Rated 5 out of 5 by MJ71 from Perfect! This was my choice online and I decided to go to store to fit it, unfortunately therewas nothing left and I had to order in another shops. I really liked this style so I asked them to deliver. Last weekend I wore the dress and everybody says it suits me. I love the dress and also the style. Rated 5 out of 5 by Mrs W from Simply Divine I bought this online a few weeks ago. I normally wear the true A line styles and was worried this might be a little snug on the hips but it is shaped perfectly! The colour is stunning and I love that it has pockets. I received numerous compliments the first time I wore it at work. Rated 4 out of 5 by diewrecktorofmayhem from Had to wear that night! I finally got my hands on this one and fortunately had a dinner date that very night so got to pop the tags straight away. Such a fun dress, maybe it's the reason I was able to dance the night away and arrive home as the sun came up! Rated 5 out of 5 by Melina from Stunning dress! I wore Venice Floral for the first time today and I have to say this is my new favourite! It has the most stunning vibrant colours and a lovely neckline and A-line fit. Great in winter with tights and a cardie. Highly recommend!! !